We don’t even have a strong Carter Hart performance to lean on, and that’s a shame. Three second period goals helped propel the Capitals to a 5-3 win on Tuesday night, sending the Flyers to an eight-straight loss. Mike McKenna made his Flyers debut, making 21 saves on 25 shots in the losing effort. Jake Voracek, Wayne Simmonds, and Claude Giroux scored for the Flyers while Jakub Vrana and T.J. Oshie both scored twice to pace the Capitals. Here are five things we learned from the Flyers’ latest defeat as they have their sights set on the 10-game losing streak they piled up a year ago. Don’t look now they’re only a couple losses away, doable by the end of the week! The seventh goalie to start for the Flyers this season, McKenna was actually okay for the most part and got left out to dry a few times by the team in front of him. He tormented Capitals sniper Alex Ovechkin all night, coming up with save after save on the star that now has just one goal in his last 10 games. Here’s one of those dandies with 8:10 left in the first, stopping Ovechkin in close off an insane pass from Evgeny Kuznetsov from below the goal line. That pass from Kuznetsov shows how valuable playing below the goal line can be and how it can create issues for both defense and goaltender. The Flyers should really get back to doing more of this at both 5-on-5 and on their slumping power play, but more on that in a minute. McKenna had no shot on either of the Caps’ first two goals, with Wilson beating the veteran on a bang-bang play in front and Oshie with a perfect deflection in the high slot. Wilson beat Ivan Provorov to the front of the net and the pass from Jakub Vrana was on the money. Vrana’s first goal was a quick move to the forehand that beat McKenna easily, the kind of speed and skill is something you don’t see often in the AHL though Sean Couturier did his goalie no favors by putting the breakaway on a silver platter. Vrana’s second goal would be the one that McKenna would like to have back as he followed the pass attempt a little too closely in anticipation and watched the puck trickle behind him to make it 4-1 Caps late in the second period. In the end the stats didn’t look too pretty for McKenna’s Flyers debut, but he only had a clear shot at two of the four goals he allowed and kept another three or four from the net by making save after save on Ovechkin. Despite notching power play goals in back-to-back games against the Hurricanes and Flames late last week, the Flyers’ power play is right back down to earth in going 0-for-6 against the Blues and Caps the last two nights. But not only did the Flyers fail to score on any of their five chances against the Caps last night, they managed just seven total shots. That’s hardly making life tough on Pheonix Copley, the Capitals’ backup netminder and has been the case for much of the season as the Flyers fail to generate enough shots on the man-advantage. The Flyers used to thrive on the power play by hitting the quick one-timers on the left circle with then-Brayden Schenn and more recently with Sean Couturier. Claude Giroux was the puppeteer on those dangerous plays, but they’ve dried up this season and the puck has spent more time on the other side of the ice with Jake Voracek and Shayne Gostisbehere playing catch with the puck as opposing teams clamp down on Ghost’s point blasts. The loss of that play has really crippled the Flyers’ power play and the way to open it back up is to get more pucks down low, but Simmonds been far from his usual threat and teams have taken to leaving him alone without fearing him making a play with the puck on his stick. Using the real estate below the goal line could help spread out the defense as well, but that likely takes away the net front presence, leaving the goaltender a clear path to the one-timer they want to get setup once again. Perhaps a more permanent return for James van Riemsdyk on the top unit can help facilitate things or even promoting Nolan Patrick as we saw late last season. Either way, the Flyers need to change things up on the power play and avoid giving teams the same look, one that hasn’t been productive and has been easy to defend this season. The Flyers held an 11-4 shot advantage through 20 minutes and appeared to be on their way to a more respectable hockey game but the little details in their game caught up with them as time went on. Despite the edge in shots, passes weren’t crisp, puck battles weren’t being won, and carelessness with the with the puck really went on to hurt the Flyers. The prime example was on Vrana’s first goal where Couturier got his pocked picked at the Caps’ blue line trying to overlap with Giroux. Vrana saw the slow-moving sequence develop, pounced when the timing was right and took off to the races to beat Couturier to the net and finish past McKenna. The turnover was bad considering the result, but also underlined more of the Flyers’ offensive struggles to create offense in the half-court set essentially. There wasn’t enough movement from the Flyers and Couturier and Giroux ended up right next to each other with no help really on the other side of the ice between them and Vrana. Neither was in a position to recover after the puck got away from them and Couturier’s lack of straight-line speed did him no help to recover with Vrana turning on the afterburners. The second came later in the game with the net empty and the Flyers down 4-2 after a Simmonds goal. Voracek tried to make a one-touch pass to Shayne Gostisbehere at the Caps blue line but Tom Wilson sniffed out the pass and carried the puck in off the steal and found the empty net to put the Flyers away. Though Scott Gordon would challenge for offsides and win to nullify the Wilson goal, it still doesn’t take away from a lazy play from Voracek nonetheless. Those are the little things that make a huge difference in what ended up being a close hockey game. For whatever reason the Flyers haven’t been able to get out of their own way at times this season but they also don’t help themselves much, either. The Flyers are very much a finesse hockey team and that is totally fine as long as those players are willing to get to the high-danger scoring areas once in a while. The great goal scorers don’t always do it, and sure Steven Stamkos rather prefers a one-time blast from the circle than he does a crease-jammer, but hey you’ve got to do it in this league. Now when you look at that heat map you see a ton of perimeter chances for the Flyers and some for the Caps as well, but where they differ is the volume of chances the Caps had in the higher danger areas. Not only did they get more action around Mike McKenna’s crease, but they had three goals to show for it as well. Tom Wilson drove the net for one, and Vrana potted two not far from the crease with one coming on a nice breakaway finish and the other as he played a pass into a dangerous area that found its way past McKenna. The Flyers peppered Pheonix Copley with 40 shots on the night, but they were far too content with testing the Capitals’ backup from distance and couldn’t or didn’t want to break down a defense that isn’t the most intimidating group in the league. 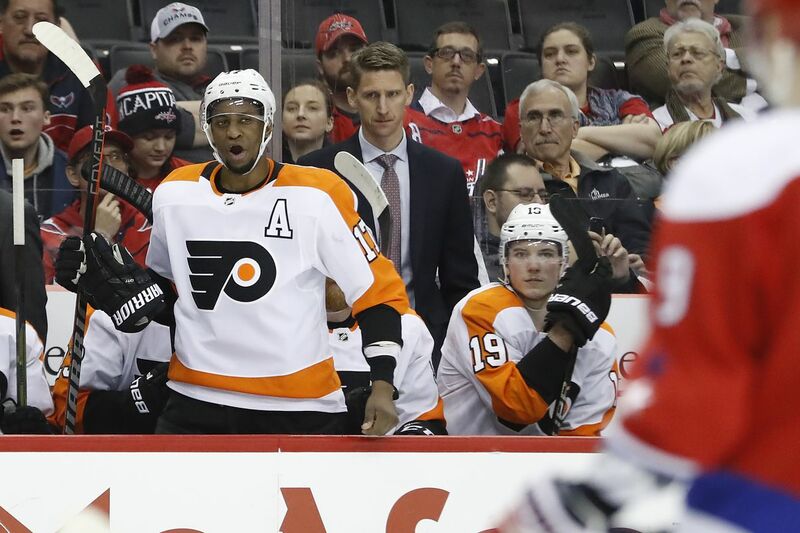 Wayne Simmonds was parked in front of Copley all night and got rewarded with his 13th goal of the season, but he was the only Flyer willing to get dirty in order to score goals and it showed. Both Wayne Simmonds and Jake Voracek has been widely speculated to be two Flyers firmly on the trade block, though for different reasons. Simmonds is on expiring contract and not likely to be re-signed while Voracek has a long-term contract, solid production and doesn’t possess a no-trade clause. Both had goals against the Caps, with Voracek skating away with a three-point night. Both players will be fascinating to watch in the coming weeks ahead of the trade deadline, where the Flyers could look to unload both players that have been part of the core for the last several seasons.